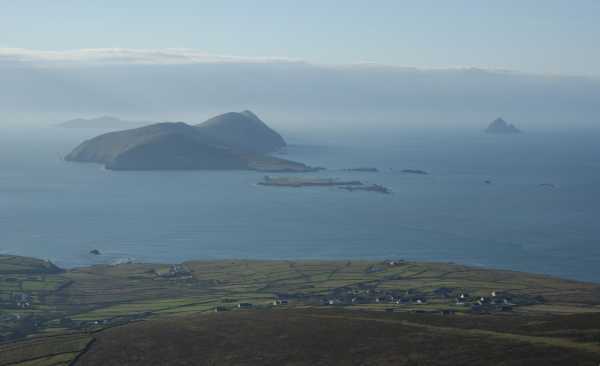 Continuing our inadvertant stalking of three5four0, a day of bracing air and superb visibility saw us indulging in some wanton ticking down the far end of Dingle. Croaghmarhin is the most striking eminence in the area (far more so than Mount Eagle, which is lumpier as well as being higher) and having shared the hill with a large family group (and their escaped dog, Max) it can be highly recommended for anyone able-bodied with an hour or so to spare. While I'm sure that gerrym's route provides the more satisfying route, we too started at the mast as per three5four0's comment, from where a steady plod up the fence on a clear path (as if it were needed...what, y'know, with the fence being there) leads in shortish order to the top. And hugely satisfying it is too: what you hope is the summit on the ascent turns out to actually be the summit, and the pronounced fall from said point gives a lot of depth to the panoramic views.